A delightful five-star luxury resort, hidden away in a picturesque valley near the village of San Lawrenz. The honey-coloured limestone building, and spacious Mediterranean style décor combine to create a tranquil, indulgent ambience. The well equipped suites have a bright, airy feel, with pleasant balconies overlooking the lush gardens and choice of pools. 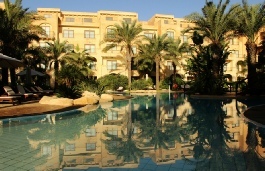 For the energetic, there are tennis and squash courts, and a well equipped fitness centre. An indoor pool takes care of the rare days when the weather is unkind. Once you’ve worked up an appetite, choose from the elegant L’Ortolan restaurant, the Italian Trattoria, or perhaps the tasty treats in the Bistro. In the summer there’s also a Gazebo garden snack bar, so you don’t have to venture too far from the beautiful pools. 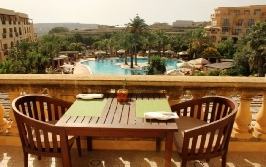 With the morning chorus of birdsong, there’s no better place to wake to the Gozo sunshine! After the hard work of climbing the steep hill to see the citadel, take your time and reward yourself with a visit to one of the little restaurants in the Citadel. My choice was the rather special Ta’ Rikardy, just inside the bastion walls, and with selection of local food and wines from its own vineyards. I’ll let you in to a little secret: once there, go up the narrow spiral stairs and take a table on the roof-top terrace – you won’t regret it. The panoramic scenery, like the cuisine, is amazing! Try the calamari in garlic and tomato sauce, served in the Boat House Restaurant at Xlendi Bay. Set in a glorious location right by the water’s edge, it was a most delightful meal. I have to admit that my fellow traveller’s mountain of seafood, with distinctive octopus legs amongst the delicacies, looked every bit as appetising, although I think it would have taken me the rest of the day to get through it! Lunchtime fish and prawn capriccio, and thick tasty onion soup at the Porto Vecchio Restaurant on the seafront in Mgarr, also left a wonderful impression, teasing the taste buds for the rest of the afternoon. Despite the fact that it’s only a tiny island nestling in the vast waters of the Mediterranean, and shadowed by its ‘big sister’ Malta, Gozo hides a multitude of surprises. As the chilly autumn winds begin to appear in Britain, it’s a great feeling to be heading south to the Mediterranean, where summer doesn’t rush to leave for another month or two. The cold, grey waters of the English Channel slip behind the clouds, and then, less than a couple of hours later, those same clouds part again like a magicians trick to reveal the azure waters of Tyrrhenian Sea. After crossing Sicily, small islands begin to appear; dry and barren, with sparse greenery but plenty of cultivation. Rectangular roofs are interlaced with little turquoise swimming pools in almost every yard, like a giant stone coffee table dappled with blue topaz incrustations. 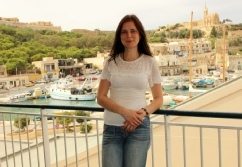 There’s no airport on Gozo, so we land in neighbouring Malta to meet our local guide, Maria. Our driver is nimble and swift, taking us quickly through the afternoon rush hour of Valetta, along a succession of hot, busy streets and small villages to the port. The well-known saying that “The Maltese don’t drive on the right or the left, they drive in the shade”, certainly appeared true here! The half-hour crossing between Malta and Gozo offers a beautiful seascape, with Malta, Gozo, and their smallest sister Comino in between. 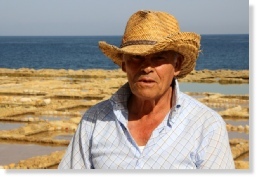 Comino is tiny (just 1.4 square miles) and permanently inhabited by only 2 farmers who’ve been living there all their life. They refuse to leave the island, even with a danger of becoming ill, and sadly as they aren’t married they have no heirs. 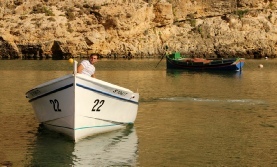 Despite its small size, Comino is a popular tourist destination, where wooden boats bring visitors for day trips, often spending time in the Blue Lagoon, and enjoying the shallow warm waters hidden from the sea by the wall of low rocks. A visit to the most visible building on the island is also popular. St Mary's Tower was built in the 15th century, and served at different times as a defensive structure, prison, and even the stage for filming ‘The Count of Monte Cristo’. 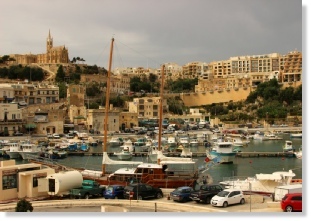 The Maltese islands are really a place where North, South, East and West all meet. For centuries it’s found itself in the way of nations from all sides en route to invade others across the sea. Each has left their trace in the Maltese landscape - and the language, Malti, which consists of approximately 60% Arabic, as well as Italian, Sicilian, French, and English. Some think that Malti derived from the language of the ancient Phoenicians who arrived in Malta in 750 B.C. 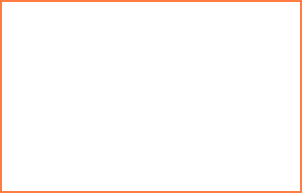 The names of places and numbers are the strongest examples of Arabic influence on the language. The proximity of the vast, hot African continent is felt from the first moments you step out of the plane. The hot humid air, even in the middle of October, the dry half-desert landscape with rare palms, and the widespread paddle cactuses with their yellow prickly pear fruits, all have that African feel. Local architecture is quite unique, but also carries a North African influence. The glorious sunny sky, half misty from humidity, is hard to avoid with little shade away from stone buildings. The islands are like a perfume, with senses of Europe, Africa and the Middle East mixed in one exotic bottle. It’s a scent that feels safe and secure, as if you are in the quietest place in Europe, but at the same time it’s intriguing with the unique architecture, cuisine and lifestyle. 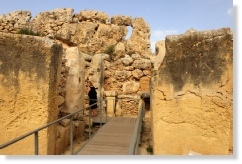 Gozo hides a lot of mysteries, both historical and mythological. In the centre of the island is one of the oldest free standing structures on Earth. The prehistoric megalithic Ggantija Temples are estimated to be 5800 years old – far older than the Great Pyramids or Stonehenge. They are possibly the site of a fertility cult, and certainly the shape of the structures is reminiscent of a woman’s shapely curves. 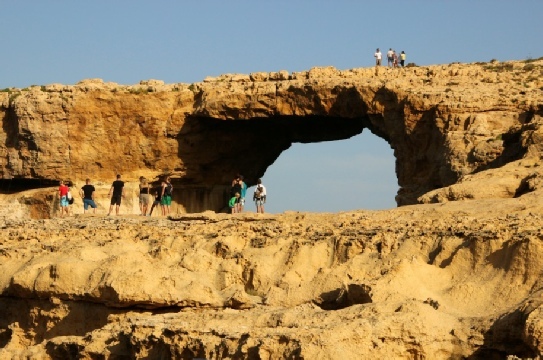 Gozo is also the island where, according to the Greek mythology, Homer’s Odyssey was kept by the nymph Calypso for seven years as a prisoner of love. It’s still possible to see the Calypso cave, although it’s no longer permitted to go inside. In the Xwejni area ancient salt pans are carved in the coastal rocks. Close by, and looking almost as ancient, is a friendly salt seller in his authentic cave-shop. It’s a perfect opportunity to bring home a little Gozitan sea and sun in a little sack of local sea salt. 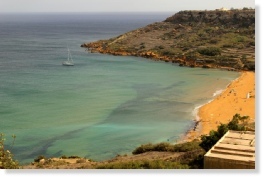 Gozo is a paradise for snorkelers and divers, with lots of unspoilt bays full of marine life. There are beautiful yellow sand beaches, such as Ramla Bay, which looks so bright against the turquoise and blue sea and sky backdrop. It’s hard to resist the clear, warm waters which are so inviting on a hot sunny day. 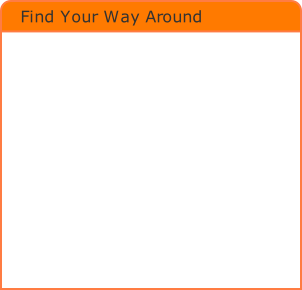 And the beauty of this island also is the fact that you can walk everywhere, and reach everything by foot. 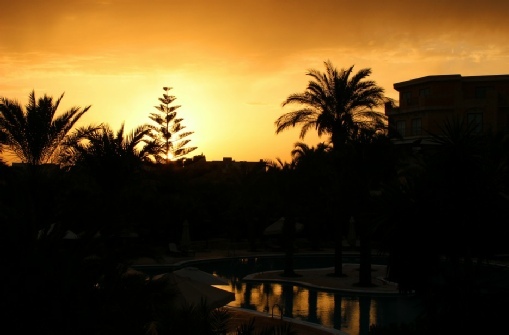 Victoria (once called Rabat), is both the heart and the capital of the island. With a population of less than 7000, it has a very relaxed atmosphere. 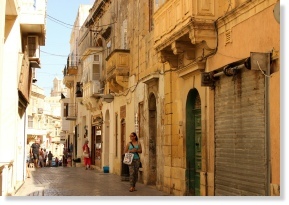 The main historical centre is the Citadel, with its narrow medieval streets of yellow stone. 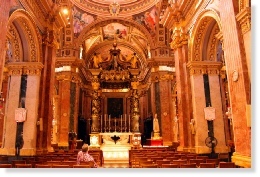 There are two magnificent cathedrals: St George’s Basilica, and the Cathedral on the citadel’s site dedicated to the Assumption. This stands on the same spot where once stood a magnificent Roman Temple. There’s also no shortage of good museums in Victoria, with the Gozo Museum of Archaeology, Folklore Museum, the Old Prison, Natural History Museums and others to keep the ardent history buff occupied. The colourful markets, and myriad of little shops are like museums of the local life. Traditional local jewellery, some similar to filigree, is exquisite. Enticing food shops and delicatessens are delightful, and it’s worth seeking out one of the Gozitan sweet treats to bring home for your loved one (or yourself!). Try a honey ring (qaqqatal-ghasel), which is made of flour, treacle, semolina, cloves and other spices. The hard working Gozitans have spent thousands of years making the fertile clay workable, by reworking rocky hillsides into the countless stepped fields and terraces that we see today. Soil was brought from the valleys – a process indicative of the determined people of these dry islands; ‘In the sweat of thy face shalt thou eat bread’. Of course the valleys are even more fertile, as I witnessed one morning on the way to Calypso Cave with a detour to Lunzjata Valley. It’s the source of several springs, where, like in the Garden of Eden, on the sides of the valley countless fruit trees with pomegranates, lemons, mandarins, figs, olives and grapes are bountiful, and complimented by abundant vegetable gardens on the valley floor. Maybe that’s why religious Gozitans built a chapel there in medieval times, dedicated to Our Lady of the Annunciation. Gozo and Malta are self-sufficient in fruits, vegetables and crops, and export a significant amount of olive oil, wine, tomato paste and sun-dried tomatoes, as well as other agricultural products. All this despite the scarcity of the main resource - fresh water. There are no lakes or rivers on the islands, only wells and springs, some of which dry out during hot summers. By law every house is built with flat roof, and a hole in the middle for collecting rain water in the rainy season into an underground basin. This water is then used for watering gardens and any dirty house work, thus saving precious fresh water. Gozitans are very assiduous and hard-working, but also kind, open, joyful and hospitable people. Sometimes it’s almost impossible to see Gozitans in daytime, and the villages look quite abandoned and almost phantom. Our tireless guide Maria suggested that the majority of men and women are busy in the fields and vineyards, and others busy with housework hidden behind the solid gates of the beautiful honey-coloured limestone houses. Gozo’s traditional crafts centre around leather, ceramic, glass, and bobbin lace making. Staying at the luxurious Kempinsky Hotel, we were close to a particularly delightful craft village, where you can see and buy a wide range of local traditional crafts. Unfortunately, I only discovered this place on my last day on the island. To make matters worse, it was Sunday, and the only workshop open was the leather craft. I should be grateful for at least that, since the majority of local people are religious and attend Sunday services regularly. Staying with local crafts, one of the most unique can be found in the II-Hagar Heart of Gozo Museum. 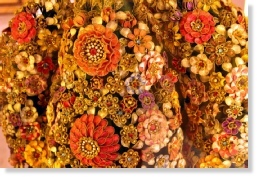 Exquisite artificial flowers made from silk thread on wire, arranged into enormous bunches, intended as church decorations. There are about 60 such arrangements around the islands, and you won’t find anything like this anywhere else away from the archipelago. Despite the hard work, Gozitans still find time to relax, and the glorious locations certainly give possibilities only dreamt of in the UK. I watched with interest as four elderly women took a leisurely dip during a hot lunchtime in Qawra Bay (also called the ‘Inland Sea’). To be more accurate, I watched their four chatty heads bobbing up and down under white sun hats, loud, jolly, and totally carefree. You could see that this was their usual place to meet and socialise, in the same way as the British might go to a cafe together. Very Mediterranean. Like many southern Europeans, the locals enjoy an active cultural life and colourful festivals, often intertwined with unique religious traditions, which take place on the islands throughout the year. Many are worth seeking out, as they will add to the richness of your stay, and are memorable experiences for those lucky visitors who happen to be there at the time. Cuisine in Gozo is mostly based around local produce, and the wide variety of sea food, thanks to the abundant marine life around the islands, and excellent choice of vegetables, fruits and vineyards. Food is quite rustic and simple in the way it’s cooked, but undoubtedly delicious with generous portions no matter which of the island’s eateries you choose. For cheese lover, the local offering is also something special, and the Gozitan’s are rightly very proud of it. The cheese was served every morning in our hotel, and I absolutely fell in love with it. The tastes vary depending on how it is served – and there is plenty of choice. It can be served very young, slightly, or strongly matured, and either with spices and herbs or without. For me the youngest, and most tender in both texture and taste was the best! While we are musing on local specialities, I was particularly intrigued by the unusual (and particularly innovative) method for catching the popular local Lampuki fish here. The Lampuki like to hide in the shade, so sharp-minded Gozitans lay palm leaves on water, and when the fish slowly begin to gather there, around goes the net! Lampuki pies are simply mouth-watering, as are pastizzis – local savoury pastries usually filled with ricotta cheese, sometime with addition of spinach. With so many delights to accompany my morning coffee at the hotel’s breakfast buffet, it was hard to know where to begin! Gozo is surprising, fulfilling, and inspiring. If you are looking for that perfect blend of time in the sun around a luxurious hotel swimming pool, first class facilities, and a wealth of local experiences close at hand, this could be the ideal choice. 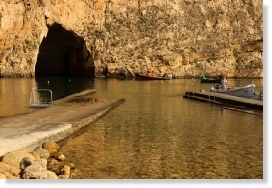 The beauty of being able to reach most places by foot, and have historical, cultural, and archaeological attractions, colourful and diverse scenery, swimming and diving amongst the fascinating rocks and sands, and the opportunity of exploring the local life, traditions and cuisine – make Gozo one of the Mediterranean’s true paradises. 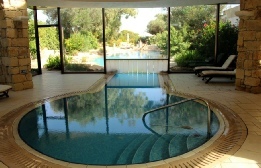 After all that food, a little relaxation is certainly needed, and Gozo is heaven for those who like spa treatments. 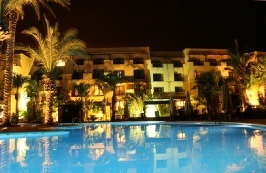 The Kempinskij Hotel is situated on the western side of the island, within walking distance of Dwejra Bay and the Azure Window. It has an award-winning spa, and Europe’s largest Ayuverdic centre, offering varieties of authentic therapies in seven traditional treatments, with the main focus on Healing and Rejuvenation. Therapies are carried out by specially trained Indian Ayuverda therapists. Hidden away on the remote highest point of the island, is the Hotel Ta’Cenc & Spa, which has a wonderfully relaxing feeling of privacy about it. Bungalow type arch buildings nestle amid colourful southern greenery, with pink, red, yellow and lilac blossom, orange trees and palms. The lagoon style heated swimming pool almost begs you to dive in, and the beautiful sea scenery, which opens in the distance behind hibiscus bushes, completes the air of relaxation and tranquillity. It’s an ideal retreat to forget any worries, and just enjoy life and the moment here with the help of the luxurious spa treatments. On a warm October evening, it was surprisingly pleasant to see so many smart and elegantly dressed people of all ages, from teenage to those in their hundreds, gracefully entering the Aurora Theatre in Gozo’s capital, Victoria. With the growing trend to dress down for theatre, looking at these eager theatre-goers was like stepping back 30 years to my childhood, when my young and beautiful parents put their best clothes on, mum sparkling with jewellery and gems on her theatre clutch, and we would go to a theatre. This night was a special one at the Aurora, as it was one of the most important Gozitan cultural annual events. It’s quite remarkable that an island with only thirty-thousand inhabitants has two opera houses. 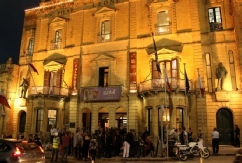 The rivals stand on the same street almost opposite each other, and during this traditional October opera season in Gozo, both theatres – the Aurora and the Astra – this year (2013) staged performances to celebrate the 200th anniversary of the birth of the most productive opera composer, Giuseppe Verdi. The Aurora was staging ‘Falstaff’, and across the street, the Astra offered ‘Othello’. Rich theatre and musical traditions in Gozo go back to 19th century, when the Philharmonic Society was established. 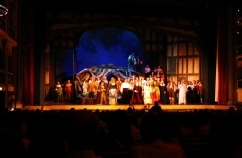 Verdi’s and Puccini’s operas are the most regularly staged in the Aurora. Award winning photographer Natalia Kolesnikova is a permanent member of the Pro Traveller team. She has a passion for travel, and where possible enjoys combining it with her love of art and music.